Having played 4 years of Division 1 college basketball in America, I enjoy watching any form of quality basketball. The Los Angeles (LA) Lakers and Orlando Magic are in the midst of battling for the crown of 2009 National Basketball Association (NBA) champion. 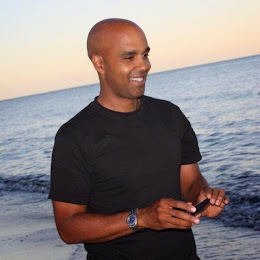 This year’s NBA Finals are the “perfect storm” of excitement for me due to a three decade loyalty to one team and a strong connection to the other. The Lakers have been my favorite team since 1979 when a twenty year old Michigan St. superstar (Magic Johnson) took the NBA by storm and brought excitement back to LA along with five championship titles. Magic has always been my favorite collegiate and professional player. He was a great inspiration for me as I was honing my basketball skills in high school. There has not been and probably never will be a NBA professional who played the point guard position with such grace, joy and competence. In 2002, I had the pleasure of meeting Magic at my health club in New York City (NYC). It was an astonishing moment walking to my locker and seeing one of the greats of the game. Normally, famous people utilize the VIP room so they won’t be disturbed; not Magic. He loves people and is very affable so I was not surprised to see him in the common locker room area. We talked for ten minutes about the current Lakers team and he treated me as if I were an old friend. It was one of my most memorable conversations with a professional athlete. He was a breath of fresh air for the NBA and one of the main reasons why the league is so popular today. Today’s current Lakers superstar is Kobe Bryant and he could end up being the 2nd best player of all time. In my opinion, Michael Jordan (MJ) reigns supreme as the “best ever” although Kobe is close in talent and ambition to MJ. At times, he has been a challenging personality for the Lakers on the court and had some immature trouble off the court. Despite his complexity, his talent and ferociousness in basketball is unquestioned. He’s a thrill to watch! In addition, Phil Jackson (former coach of MJ) is the Lakers head coach and his resume includes 10 NBA championships (1 as a player and 9 as a coach). Anyone who doubts his coaching ability and motivational skills doesn’t know the game of basketball. I love sports yet only have an affinity for one team, the Los Angeles Lakers. My heart bleeds purple and gold (uniform colors) and fortunately we have enjoyed immense success in the last 30 years with Magic’s aforementioned titles and most recently, three consecutive ones from 2000-02. In addition, the next five years look promising as long as Kobe is around and Phil is the coach. The Magic have one very good player (Dwight Howard) and others who have performed their roles extremely well in reaching the NBA Finals. Orlando was not supposed to be here yet they are playing in the biggest series in franchise history. In my opinion, one of the main reasons for their excellence thus far is their head coach, Stan Van Gundy. He has worked tirelessly in basketball throughout his life to reach the pinnacle in his coaching profession; the NBA Finals. His team is one of the least talented to reach any NBA Final yet he has been able to motivate and coach them to huge wins over the Boston Celtics and the heavily favored Cleveland Cavaliers. How can I make such glowing statements about Stan Van Gundy? He was my assistant coach in college. Early in his career, Stan spent two years at the University of Vermont (UVM) - one year with me during my freshman year. Stan was truly passionate about basketball and had a solid and insightful grasp of the game despite his young age. He didn’t play favorites and knew exactly who should be playing and who shouldn’t. Our head coach at the time was incompetent in numerous ways so we were lucky to have Stan as an assistant. I credit Stan with making sure that I and others received the playing time that we deserved. Our head coach wasn’t going to give me adequate minutes during the year but Stan pushed for my presence in the rotation and I was a key reserve (6th man) for the team. In addition, our private workouts were tough with Stan being relentless in pushing me to make sure I received the maximum benefit from our training. He left after my first year and our team was never the same. Stan saw the writing on the wall with the dismal direction our head coach was taking us so he was wise to make the move away from UVM. During my four years of basketball at UVM, my freshman year was the most positive and Stan was a big reason why. Three years later, our head coach was fired (10 of 12 players supported the decision) and Tom Brennan from Yale University was hired. The new coach took UVM to great heights in the next 19 years including 3 consecutive appearances in the NCAA tournament and an unbelievable win over national power Syracuse. Unfortunately, Coach Brennan’s first year was my last although it warms my heart to see the great success of UVM basketball in his last 9 years. One might think that my personal connection (Stan) would lead me to support the team from Florida. No way. A true fan should ALWAYS support his/her team. I want the Lakers to win and I expect them to do so with little discomfort. If the Magic were to pull off an upset, I would be incredibly happy for Stan. Stan was always gracious when we would see each other from time to time after I graduated. When I worked for Madison Square Garden (MSG) and he was an NBA assistant coach for the legendary Pat Riley’s Miami Heat, I would often go down to the bench to exchange pleasantries with him before the game. Gswede will have a smile on his face no matter which team emerges victorious. The smile will of course be much wider if the Lakers win along with another natural high for me and the ninth Lakers championship since 1980. If the Orlando Magic were to do the unexpected, it would be wonderful in many aspects including a showcase to NBA General Managers on three invaluable elements for success in professional basketball; teamwork, discipline and players performing superbly within their assigned roles. The Lakers crushed the Magic in Game 1 last Thursday. Game 2 is tonight. It should be exciting as the series unfolds but only one team can come out on top. Will it be My Lakers or Stan Van Gundy’s Orlando Magic? My prediction – Lakers in 6 games. 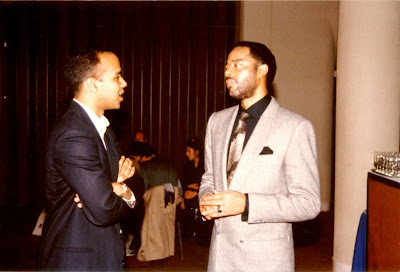 Gswede talking to to Walt "Clyde" Frazier (on right) in the early 1990's. He was called "Clyde the the Glide" due to his smooth style of play and is one of the top point guards in NBA history. He also won 2 NBA championships with the New York Knicks. Good article on Phil Jackson and Stan Van Gundy. The Magic head coach thinks Rachmaninoff is a Russian point guard. Jackson knows the name of the third-chair French horn in every world-class orchestra. Jackson reads books like "Zen and the Art of Motorcycle Maintenance." Van Gundy reads and re-reads "Coaching Basketball for Dummies." A funny thing has happened in these playoffs, though. Van Gundy looks like a "Master of Panic" (Shaquille O'Neal's slam) only because he can sweat through a Dry Fit crewneck just rising for the national anthem. The rest of the Van Gundy Experience - his handling of his team and the postgame news conferences - have done wonders for his reputation. He's made a lot of right moves and said a lot of the right things, whether it's telling his players what they don't want to hear or propping them up after a difficult loss. "I'm a master motivator," he joked in saying that it took him two days to come up with what to say to turn Rafer Alston's playoffs around. "I told him, 'Play your game.' "
Jackson has won nine titles. A 10th would move him past Red Auerbach, who wasn't shy about saying that he thought Jackson's success stemmed from inheriting championship-ready teams. I don't know about that. I do know that when the TV coverage takes you inside the Lakers huddle to pick up Jackson's words to his team, his tone suggests timeouts are an unwelcome interruption in his busy schedule. Van Gundy is self-deprecating. Jackson comes across as being pretty sure he would've invented basketball had not James Naismith benefited from an earlier birth date. Nice piece big bald man. Sounds like Stan VG had alot more personality than his younger brother Jeff!